ST to ST 50/125 Multimode Duplex Orange 7 Meter Fiber Cable. ENET 50/125 OM2 Multimode Duplex Cables are designed to carry increased bandwidth for mission-critical data transference and support cross-compatibility to existing 50/125 Multimode fiber applications. 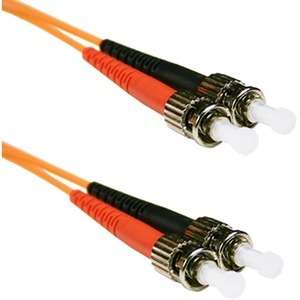 These cables are built using any combination of connectors including LC, SC, and ST. ENET Fiber Patch Cables are designed to work with LED and VCSEL laser light sources including 1000BASE-SX and 1000BASE-LX applications in both SFP and GBIC Form-factors. All ENET Fiber patch cables are 100% fully tested for insertion and return loss guaranteeing the highest quality product available.